Have you lost confidence in your weight loss surgery tool? Welcome to the 5 Day Pouch Test. I am Kaye Bailey and I developed the 5 Day Pouch Test in 2007 through extensive research and personal experience. Seven years after gastric bypass I started to regain weight. Weight loss surgery became another diet failure, another disappointment. My surgeon told me to "get back to basics" but he didn't tell me how. Like most bariatric patients who see weight regain, I was on my own to figure it out or surrender one more time to obesity. No matter how I vowed each morning that this would be the day I quit snacking on the soft comfortable simple carbohydrates and get back to the weight loss surgery high protein diet, by noon I was dipping into the cracker barrel or popcorn bucket or cookie jar. The cycle of morning resolve followed by mid-day submission to cravings led to self-loathing and feelings of weakness and failure. Have you found yourself in a similar cycle? Many of us do, but it’s not because we are weak or spineless or moral failures. It turns out the human body’s metabolic system is far stronger than willpower. I wasn’t craving soft carbs by noon because I was morally weak. Those cravings were the body’s “tune engine” alarm sounding too loudly to ignore. This knowledge powered the creation of the 5 Day Pouch Test where over the course of five days we do some engine maintenance and gently transition the body from simple carbs and snacks to the WLS high protein diet supported with complex carbohydrates found in vegetables, fruit, and grains. The plan works because when we manage our metabolic system with the same attention we give to willpower there is nothing that can stop us. If this scenario is familiar to you I invite you to give the 5 Day Pouch Test a try. If you make your plan today and follow Day 1 tomorrow by next week you will know how magnificent and powerful you are. 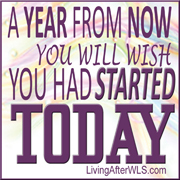 You own your WLS, and of course we all know WLS is “only a tool.” Give the 5 Day Pouch Test a try. I bet you learn your tool is not broken; it just needs a little tune-up. Let’s begin and get back on track together, you are not alone. "Hundreds of people have taken control of their surgical pouch by following the 5 Day Pouch Test. At the end of Day 5 many who were sad and hopeless at the beginning of the week report euphoria knowing the pouch is functioning properly. Hopelessness is replaced with confidence. Five days. That is all it takes to turn things around. I'm ready to learn the 5 Day Pouch Test plan! "I have found the 5DPT to be invaluable. I regained my focus on this plan. Protein did feel uncomfortable so sliders were easier but until this plan I had not recognised this. Now I am on track and more importantly feel empowered and happy." "I have this book and live by it. When I get off track from weight loss surgery and feel hopeless, I pick up this book and follow the 5 Day Pouch Test. In those five days I feel back in control and empowered. I highly recommend this book to anyone who has had WLS. I have bought several of these books as gifts for my new weight loss surgery friends." "I had been searching for something since my surgery in 2006 that would give me the knowledge I needed to keep my weight off. My support group folded and I was left alone with so many questions. I kept it off for almost 5 years and then gained 40 lbs. I started searching the web for anything that would help. I was desperate! That's when I came across your website and read your story. I bought the 5-DPT and I lost almost all of the 40 lbs. I struggle here and there, but It works!" "Thanks for your website. I feel I found my answer to NO SUCCESS with Lapland surgery. I am going to do the 5 Day Pouch Test and start over. I barely lost any weight after my surgery and have completely stopped going to my doctor for rechecks. After reading some of your articles, I found I eat way too many slider foods. I will continue to read all your essays and get back on track after two years with no success." "I have read and completed the 5 Day Pouch Test. I had surgery 10-2002. I lost 115 pounds, never reached my goal and had regained 45 pounds. The after care was none for me. No follow-ups after the first 6 months. I was on my own. For years I have prayed for a "do over". I was talking with my counselor in tears one day and she told me about the 5DPT. I then found you and LAWLS. Since April I lost 35 pounds. I know I will make it because I know I am not alone, I have support!!" "Thank you for a renewed faith in myself and my tool. Thank you for making the information available and easy to find. I have made an appointment with my weight loss surgery center and a dietician and thanks to you and your extraordinary team of researchers, I am on the road back from where I've been. It is never too late to regain control. We are never really broken, just a little off track." Kaye Bailey developed the 5 Day Pouch Test in 2007 and is the owner of LivingAfterWLS and the 5 Day Pouch Test websites. Ms. Bailey, a professional research journalist and bariatric RNY (gastric bypass) patient since 1999, brings professional research methodology and personal experience to her publications focused on long-lasting successful weight management after surgery. Kaye Bailey is the author of countless articles syndicated in several languages, and books available in print and electronic format including The 5 Day Pouch Test Owner's Manual 2nd Edition 2012, (1st Edition 2008 out-of-print, 50K copies in circulation); Day 6: Beyond the 5 Day Pouch Test (2009 – 3rd Printing January 2015); Cooking with Kaye Methods to Meals: Protein First Recipes You Will Love (2012). Copyright 2007 - 2015 LivingAfterWLS, Ltd. Liability Co. ~ All Rights Reserved. The health content in the LivingAfterWLS and 5 Day Pouch Test websites is intended to inform, not prescribe, and is not meant to be a substitute for the advice and care of a qualified health-care professional.